Guess what’s coming in Vietnam! 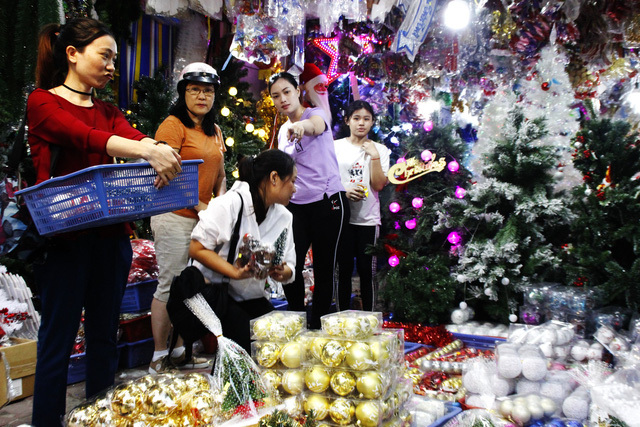 People do the shopping to prepare for Christmas in this 2017 file photo by Tuoi Tre. If you haven’t got your X-mas, NYE and Tet plans sorted out yet, then you’re looney, loco and lazy! We’re four weeks from Christmas, five weeks from the Western New Year’s Eve – a four-day holiday – and over two months after that, the longest Tet holiday in probably the last three years running for nearly ten days from the 2nd of February to the 10th! Whew! Like the imaginary president in the movie, ‘Independence Day,” I guess you could say, “…the best idea right now is to stay in your homes.” Well, that might be ok except a lot of your favorite drinking holes might close along with your trusty local supermarkets. Expect lots of home-made singing to jangle your nerves and night-time traffic to resemble an All-Blacks football match. Or as the president mentions later on, “If you feel compelled to leave these cities, please do so, in an orderly fashion.” Really? Rightttt… Have you seen a Vietnamese bus station anywhere near Tet? Total mayhem! Or better yet; the queues at the airports? Get there three hours early (minimum), buy cheap water outside the airport before you have to ditch everything at the X-ray machine and you’ll have five minutes to wolf down your Burger King meal before your boarding gate is switched to the downstairs waiting lounge. Sitting things out on Phu Quoc Island or heading up to Phong Nha Park are good ideas, however with the late arrival of winter in Vietnam this year – you might just have to stay in the bar for a few days watching the rain dribble down the windows. Visiting your relatives back in your home countries is a good idea. Lots of yummy food and a new crowd to belly-ache about Vietnam are some of the benefits. The downside will be the damage to your budget and wallet as you suddenly are reminded of the cost of living back home and why Vietnam is still heaven to live in. The greatest danger however is the barely perceptible manner in which Vietnamese businesses start to shut down over these next three months (December and February), making it almost impossible to do business or find a repairman or a laundry place that’s still open. Do you still remember how to wash clothes in a sink like your thoughtful grandma taught you? If you are living in any of the major cities, be warned, both Christmas and NYE result in serious traffic jams, locals drinking way more than usual adding to the hazards and drunken brawls to break out in the major backpacker/touristy areas such as District 1 in Ho Chi Minh City. Rooftop bars and the major hotels will do a roaring trade. You know the prices will head skyward so it might be better to lock in and book a venue on any of the special deals soon popping up on Facebook and other social media. Watch out too for the blatantly photoshopped food pictures – sometimes the Vietnamese idea of a buffet is no bigger than a tea-tray with finger food. With the weather hanging in the balance in this year’s very unseasonal climate, indoor venues are recommended and preferably more expensive than most Vietnamese and jaded foreigners will tolerate so you keep the riff-raff out! Blowing huge clouds of ciggie smoke at easily offended tourists also helps to maintain that peaceful perimeter of contentment that you want to aim for in this upcoming festive season. So by now you are getting the idea that your peaceful Vietnamese lifestyle may become that little bit less tranquil unless you start planning now. Remember that you owe it to your loved ones and yourself to retain your mental sanity as Vietnam jumps through the hoops of holidays regardless of what you’re up to. Do not rely on your dumbphone for assistance – it knows nothing of holiday madness or the escape routes. Buy a notebook and scribble down some ideas. Who knows? You might save family relationships, love affairs and the plight of your pets with considered, measured and down-right sneaky ways to chill out as everyone wears ridiculous Santa hats, rides around with a Larue beer in their left hand and still wear banana shirts even though that’s last year’s fashions. I believe dressing up as a motorbike ninja is the new trend… Now you have been about what’s coming. Please don’t contact as I will be ensconced on a foreign beach yet again calling out for a refill and wishing you all well as the sun sets over my little piece of heaven. Cheers!